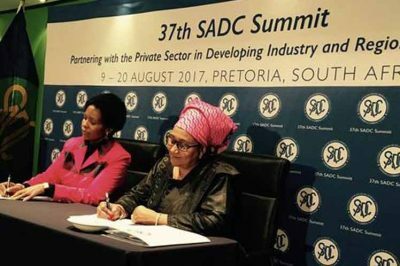 Pretoria, South Africa was the scene of the 37th Summit of the Southern African Development Community (SADC) on August 19-20. President Jacob Zuma was sworn in as the new chairperson taking over the reins of authority from King Mswati III of the Kingdom of Swaziland. This regional organization founded in 1992 in Windhoek, Republic of Namibia, after previously being formed in 1980 as the Southern African Development Coordination Conference (SADCC), met under the theme of “partnering with the private sector in developing industry and regional value chains.” The gathering took place amid profound challenges facing the sub-continent including climate change, the decline in primary commodities prices for export and consumption which has plunged the largest economy in the region, the Republic of South Africa into recession, security concerns, rising gender-based violence, among other challenges. At the beginning of the Summit SADC existed as a regional economic grouping consisting of 15 member states: Angola, Botswana, Democratic Republic of Congo, Lesotho, Madagascar, Malawi, Mauritius, Mozambique, Namibia, Seychelles, South Africa, Swaziland, Tanzania, Zambia and Zimbabwe. The organization is designed to foster sub-continental integration and the elimination of poverty throughout Southern Africa by encouraging economic cooperation along with enhancing peace and security. As a result of the historical legacy of apartheid colonialism in South Africa, the neighboring states in the SADC region are dependent upon the continent’s most developed economy for labor participation, transportation links and communications infrastructure. All of the leaders meeting in South Africa recognized that the organization must move rapidly to transform the economy of the region in order to stave off further social stagnation, job losses and impoverishment of the workers, farmers and youth. During the course of the Summit the leaders elected other officers to implement the SADC policies over the next year. Those chosen at the meeting were His Excellency, Dr. Hage G. Geingob, President of the Republic of Namibia as Deputy Chairperson of SADC, His Excellency, Jose Eduardo dos Santos President of Angola as Chairperson of the Organ on Politics, Defense and Security Cooperation and elected His Excellency Edgar Chagwa Lungu and President of the Republic of Zambia as the Chairperson of the Organ. An important addition to the SADC grouping was the Union of Comoros bringing the number of members to 16. The Comoros Islands are located in the Indian Ocean on the Mozambique Channel. There are four major islands in the archipelago along with many smaller ones: Grande Comore; Moheli; Anjouan; and Mayotte. Nonetheless, Mayotte chose to reject national independence and remains a colony of France. Comoros declared itself as a sovereign state in 1974 and considers the integration of Mayotte with France to be null and void. The population of the Union is less than 800,000 and is a largely agricultural territory. However, the government of President Azali Assoumani believes that joining SADC with its focus on re-industrialization will assist the economy in its development efforts. Some of the highlights of the final declaration included commendation of the Democratic Republic of Congo (DRC) for its efforts to maintain stability inside this vast nation. SADC condemned attempts by western governments to interfere in the internal affairs of the DRC by imposing sanctions on political figures acknowledging that the holding of national elections would not be feasible by December of 2017. A Double Troika established to monitor events in the Kingdom of Lesotho was continued. The summit encouraged the Prime Minister Motsohae Thomas Thabane to abide by the agreements designed by SADC to ensure democratic practice in Lesotho where elections were recently held leading to the creation of a coalition government. The declaration noted its displeasure with the lack of progress in moving toward independence in the Western Sahara still under the control of the Kingdom of Morocco. The North African state was readmitted to the African Union (AU) in 2016 over the objections of several SADC member-states. Morocco had withdrawn from the predecessor of the AU, the Organization of African Unity (OAU), as early as 1984 when the continental body voted to recognize the Sahrawi Arab Democratic Republic (SADR) as a full member. During the course of the SADC Summit demonstrations were held outside of the venue in Pretoria. Many of the protesters advanced causes that would undermine the independence and sovereignty of member-states along with the overall regional structures in Africa. A group calling itself the “SADC Democracy Forum” criticized the Republic of South Africa for not turning over Republic of Sudan President Omar Hassan al-Bashir to the International Criminal Court (ICC) in the Netherlands when the leader attended an AU summit inside the country in June 2015. The desire of the government of President Zuma to withdraw South Africa from the Rome Statute which guides the ICC has been thwarted by the constitutional court. These same protesters also demanded that Republic of Zimbabwe First Lady Grace Mugabe not be granted diplomatic immunity after a South African model alleged that she was assaulted by her. Mugabe was allowed to leave South Africa without being forced to answer to the claims which received wide publicity in the media. Zambia was targeted by the protesters when they insisted that President Edgar Lungu not be allowed to speak due to the state of emergency declared and the previous detention of a prominent opposition leader. The DRC was attacked for not holding elections as demonstrators demanded the resignation of President Joseph Kabila, a long-time member of SADC. The acceptance of such demands advocated by opposition groups gathered outside the Summit venue would overturn the protocols of both the AU and SADC. Such positions coincide with those of the western imperialist states designed to reverse advances made toward African unity and cooperation between internationally-recognized governments. Police utilized crowd control tactics to prevent further disruptions. The objective of the demonstrations was to bring into question the very essence of regional unity and integration in contemporary Africa. These developments must be viewed within the broader context of the worsening economic crisis on the continent emanating from the existing international division of labor and economic power. Military forces from the United States under the banner of the Africa Command (AFRICOM) are deployed in at least 35 of the 55 member-states of the AU. A mechanism for re-colonization is already firmly in place and if the AU member-states and their regional affiliates do not move rapidly towards a unified political, economic and military strategy prospects for genuine growth and development will remain stifled. Peace and stability can only be realized through the initiatives of the African people based upon their own interests and priorities.